In a time when sequels and reboots abound, Pixar decided to breathe a little new air into the “Monsters, Inc.” universe with a prequel to explore how Mike Wazowski (Billy Crystal) and James P. “Sulley” Sullivan (John Goodman) became friends. When we first saw Mike and Sulley in “Monsters, Inc.”, they were an unbeatable “Scare Team” at Monsters, Inc.: a company that harnessed frightened children’s screams to generate power. 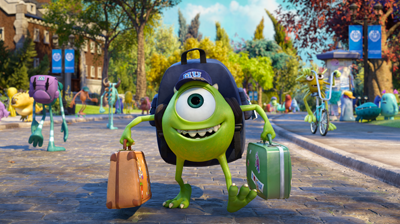 “Monsters University” opens with a fresh-faced Mike as an elementary school student on a field trip to Monsters, Inc. It’s on this trip that Mike falls in love with the idea of being a “Scarer”, and he’s encouraged by one of the hot-shot scarers to go to his alma mater: Monsters U.
Fast-forward a few years, and Mike is now a retainer-mouthed freshman at Monsters University, majoring in Scaring. His roommate is the terribly insecure Randy (the character of Randall, reprised by the remarkable Steve Buscemi), whose chameleonic powers are exceeded only by his creepiness. As Mike attends his first scaring class, he’s introduced to the most powerful person on campus: Dean Hardscrabble (played delightfully by Helen Mirren). The Dean has a warning for all potential scarers: failure to pass the semester final exam will result in expulsion from the Scaring program. Mike hits the books, while classmate Sulley spends all of his time partying with the alpha fraternity, RΩR (pronounced “Roar Omega Roar”), led by BMoC Johnny Worthington (Nathan Fillion). Come the final, Mike knows all the theory forwards, backwards, sideways and down but lacks the technique to pull off a true scare. Sulley, riding the coattails of his father’s legacy, has the roar without any of the book-smarts. It’s easy to see where “Animal House” provided ample material for Pixar; there’s even an (accidental) guitar-smashing moment that’s vaguely reminiscent of Bluto’s run-in with a guitar during the Delta House’s toga party. 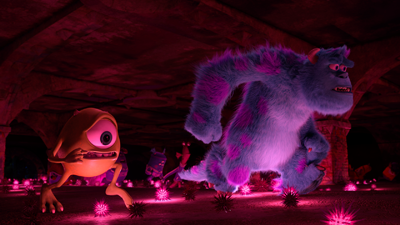 When the two are dropped from the Scaring program, Mike blames Sulley and charges out on his own to win back his shot at being scary through the “Scare Games” – an inter-fraternity scaring challenge that’s some kind of Pan-Hellenic nightmare tour. 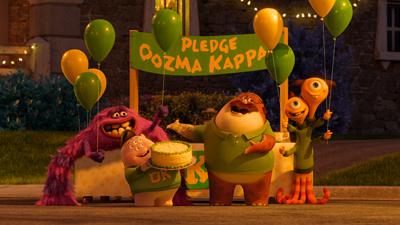 Requiring a Greek sponsor, Mike and Sulley join up with OK – Oozma Kappa – the misfit fraternity that’s clearly chronically under-recruited and undesirable. This is where the movie mines the “Revenge of the Nerds” oeuvre rather liberally, with results as satisfying as those when Lambda Lambda Lambda went up against the Alpha Betas in the Greek Games. There are still challenges left for Mike and Sulley, but most of those revolve around the pair’s complex relationship: built first on mutual dislike that eventually turns into respect and true collegiality. You see the delicate machine of their Scaring Team come together brilliantly by the end of the film, and the pair really learn how to leverage each others’ strengths to win – together. While Mike and Sulley’s story is satisfying from a perspective of “Ah, this explains everything“, it’s not exactly original – and that’s really the only issue I have with the film. I came out of it having definitely enjoyed myself, but it was all too easy to see where the filmmakers had taken a bit too much inspiration from teen/college/coming of age movies that came before – “Animal House”, “Revenge of the Nerds”…even “Carrie”. At least Dean Hardscrabble wasn’t the fool Dean Wormer was, but it’s impossible to imagine Helen Mirren ever playing the fool. 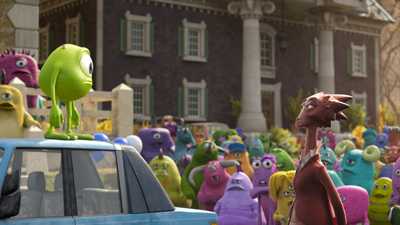 “Monsters University” was an enjoyable and amusing film, but it lacked the originality and spark that so many prior Pixar films showed (including the original “Monsters, Inc.”). From a technical perspective, I have to say that this was a delightful view in 3D. I’m sure that it’s fine in 2D, but the depth and scale of both the characters and the Monsters University campus really stand out far more with the very well-done 3D. The voicework is fantastic, with the reprising actors (including Crystal, Goodman, and Buscemi) all turning in great performances. The movie is rated G – raising the natural question: “Should I take my kids to see Monsters University?” I can’t speak for all kids, but for little ones that had no trouble dealing with the scare factor in “Monsters, Inc.”, “Monsters University” should be fine. I actually found this movie less scary than the first movie in the franchise, so I’d say this movie should appeal well to little ones and grown-ups alike. 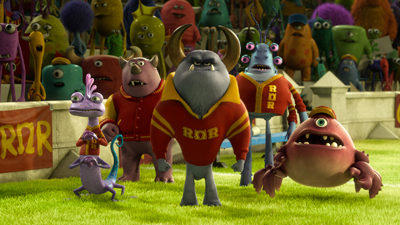 “Monsters University” is preceded by a really fantastic short film – “The Blue Umbrella” – providing ample reason to make it to the seats on-time. 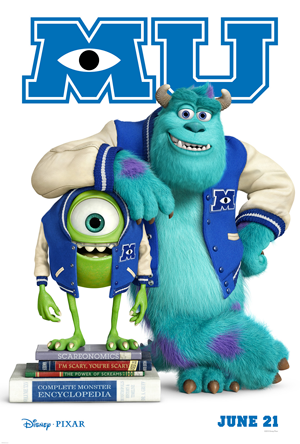 “Monsters University 3D” opens nationwide on June 21, 2013. This movie is rated G (General Audiences). This entry was posted in movie reviews and tagged 3d, disney, Monsters Inc, Monsters University, MonstersU, movie, movie review, MU by crunchymetromom. Bookmark the permalink. Good review. Still has the heart of the first one, but not as fun or as entertaining as that last one, especially considering we all know where the story goes and the beats it’s going to hit.